“When we speak about justice, we’re talking about several things. We’re talking about social justice, which is working so that everyone has the same opportunities and the same access. We are also talking about climate justice and collaborating with the environment, because that’s something that affects us all,” explains Caridad Gutierrez, the President of Pa’lante Green Cleaning, a worker’s cooperative based in NYC. Founded in 2014 in Jackson Heights, Queens, Pa’lante Green Cleaning (“pa’lante” means “forward” in Spanish) is part of a growing renaissance of worker-owned cooperatives currently operating in NYC. Beyond offering high-quality cleaning services, their work builds a more equitable system, both economically and environmentally. Though coops are nothing new (some of our favorites have been around since the 1970s), they are an increasingly attractive option for workers fed up with an unlivable federal minimum wage and intense income inequality. (While tech businesses and startups have offered some alternative business models, in many places these can further exacerbate tensions.) 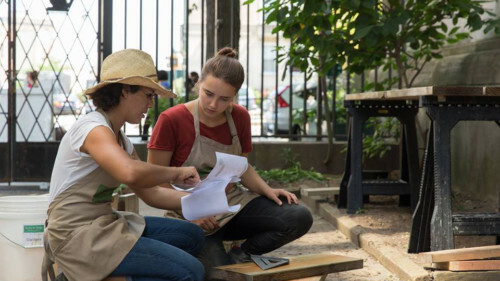 In New York– where gentrification and inequality are most acutely felt–, coops have become an achievable option, in part thanks to NYC’s Worker Cooperative Business Development Initiative, which devoted $1.2 million to supporting worker cooperatives and in the first year doubled the amount of coops in NYC. In NYC, green cleaning worker cooperatives in particular have become a burgeoning industry. Historically, the cleaning industry has been one dominated by women and immigrants– two groups particularly vulnerable to lower wages and exploitation. In addition to Pa’lante, Si Se Puede! Women’s Cooperative, We Can Do It!, Ecomundo Cleaning, and Bioclassic Cleaning all offer green cleaning services and are entirely worker-owned. In addition to the systematic change worker cooperatives engender, they support the success of individuals as well. To learn more about Pa’lante Green Cleaning, visit their website. Need to do a little light tidying at home? Try making your own sage and lavender cleaner.